Small perennial, rhizomatous herbs. Leaves exstipulate; radical biternate, long petioled; cauline solitary or two; 3-foliolate. Flowers up to 5 in number. small, greenish, bisexual, in condensed cymose clusters. Calyx 2-3-lobed. Corolla 4-6-lobed. Stamens 4-5, epipetalous, alternating with the corolla lobes and apparently double their number, due to the deeply divided filaments; anthers monothecous. Carpels (2-)3-5, syncarpous. Ovary semi-inferior, with one pendulous ovule in each loculus. Fruit a drupe. The family had been considered as monotypic, but quite recently Wu Cheng-Yi (in Acta Bot. Yunnanica 34:383-388, t. 1-2. 1981) has described two new Chinese genera-Tetradoxa C.Y. Wu and Sinadoxa C.Y. Wu. The family's systematic position is doubtful. 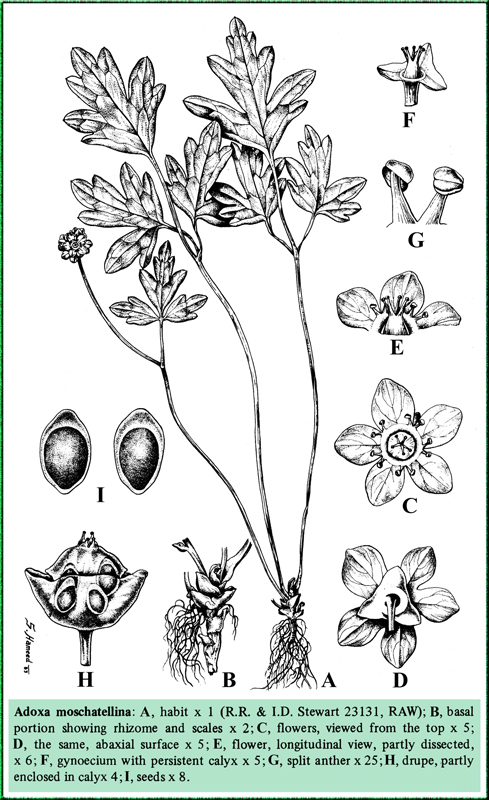 It was previously included in the Caprifoliaceae by Clarke (in Hook. f., Fl. Brit. Ind. 3:1.1880), from which it differs in the split stamens, semi-inferior ovary, 3-5-parted style and the general habit of the plant. Clarke (op. cit.) related the genus Adoxa to Chrysosplenium (Saxifragaceae). Willis (1973, ed. 8. Diet. Flow. Pl. & Ferns) is of the view that the family bears some resemblance to the Araliaceae, which it resembles in the inconspicuous flowers, semi-inferior ovary and the pendulous ovules. The present view is that family Adoxaceae is best placed between the families Caprifoliaceae and Valerianaceae. Acknowledgements: We are grateful to the U.S. Department of Agriculture for financing this research under PL-480. Thanks are also due to Mr. I.C. Hedge of the Royal Botanic Garden, Edinburgh for going through the manuscript.